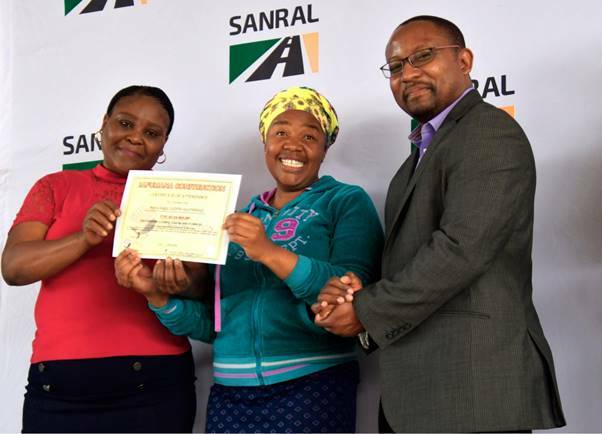 SMMEs and NGOs from the Thembisile Hani Local Municipality have benefitted from SANRAL training programmes. (From left to right) Hon. Cllr Motanyane with recipient, Hluphekile Mahlangu and Progress Hlahla, SANRAL Regional Manager. Small, medium and micro-sized enterprises (SMMEs) and Non-Governmental Organisations (NGOs) from the Thembisile Hani Local Municipality recently completed training programmes designed to provide them with the skills they require to succeed in the construction industry. In total, 135 SMMEs and 185 NGOs attended the programmes, with the SMMEs placing focus on the process of applying for tenders. While working on the Moloto Road project and seeking to partner with locals, the South African National Roads Agency (SOC) Limited (SANRAL) noticed local SMMEs have little exposure to the tendering process, which disadvantages them when responding to bids. SANRAL Northern Region Manager, Progress Hlahla, said: “If we are going to transform the construction industry, it goes without saying that where we can we must provide emerging black-owned businesses with the support they require. Participants in the programme were trained in contract documentation, pricing and basic tendering processes, amongst other skills. Project Manager of section 2 on the road, Nontobeko Mathenjwa, said: “This is a good story for us to tell. Over the years, we have been working on transforming Moloto Road from one of death to one that brings an enhanced livelihood for South Africans. To date, R21-million has been spent on local sub-contractors, SMMEs and local suppliers in the Mpumalanga section of the Moloto Road project, a considerable contribution to the local economy and job creation. The R573 Moloto Road is one of South Africa’s busiest and essential economic routes connecting Gauteng, Mpumalanga and Limpopo. It is part of SIP1, which is designed to unlock the northern mineral belt with the Waterberg as the catalyst. The Mpumalanga section was incorporated into the SANRAL network in 2015 and since then, continued routine road maintenance has been done to improve safety and mobility. Approximately R4.5-billion has been allocated to the road upgrade across Mpumalanga, Limpopo and Gauteng over a five-year period.